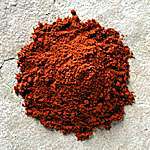 Paprika is a spice which comes from a mild red pepper in the family Capsicum annum. It is a brilliant red powder and often used as a garnish. The peppers used in Paprika are grown in Hungary, Spain, South America (Perú), and California. Paprika is the main flavor in Hungarian cooking, including dishes such as Goulash and Chicken Paprikash. In the United States, it is often used as a garnish on stuffed eggs, fish, and cheese and vegetable casseroles. Spanish Paprika flavors shellfish, rice, and sausage dishes. In Morocco, Paprika is used in tomato dishes and salads. Paprika ranges from sweet and mild to hot. American Paprika is the blandest, while Hungarian Paprika has the greatest range of flavor. Paprika, as a member of the capsicum family, is indigenous to the Western Hemisphere. The pepper is grown widely and takes on a slightly different flavor depending on local soil and climatic conditions. Paprika is useful as a simple garnish for almost any savory dish. Combine it with butter, margarine, or oil for a quick baste for fish or poultry. This is especially good on roast turkey. Paprika can be mixed with bread crumbs before sprinkling them over casseroles or vegetables.